April 4, 2017, marked the 50th anniversary of the Rev. Dr. Martin Luther King, Jr.’s prophetic sermon, “Beyond Vietnam: A Time to Break Silence,” at The Riverside Church in New York. April 4, 2018, will b the 50th anniversary of his assassination. During the last year of his life, he struggled in the midst of war and governmental abandonment of the poor to create new multiracial, multi-religious coalitions of action -- coalitions rooted in the spiritual vision of a society committed not to "things" but to people. As he faced a government obsessed with an immoral and destructive war, today we face the US government's extraordinary efforts to expand the overwhelming wealth and power of the few, and to subjugate the poor, Black and Brown communities, Muslims and oher religious minorities, immigrants, women, those who identify as LGBTQ, those who need medical care, the press, the working and middle class, and even our all-nurturing Mother Earth. In Washington DC, on April 4, we gathered at the New York Avenue Presbyterian Church for a teach-in: reflection on Dr. King’s message, followed by action. We began with an intergenerational and interfaith conversation about our current moral crisis with Sister Simone Campbell (“Nuns on the Bus”); Rabbi David Saperstein (former Director, Religious Action Ctnter of Reform Judaism); Imam Talib Shareef (Masjid Muhammad); and Rev Anthony Grimes (Fellowship of Reconciliation & Black Lives Matter). Workshops and teach-ins on the triplets of racism, materialism and militarism followed. The day culminated with a multi-religious Call to Prayerful Action by leaders from Jewish, Catholic, Protestant, Buddhist, and Bahai communities, and then rousing calls by Rev. Aundreia Alexander (Associate General Secretary, National Council of Churches) and Bishop Dwayne Royster (Political Director, PICO National Network) sending the community forth on a March to the White House where we held a Vigil till a minute of silence at 6:01 pm, the moment of Dr. King's death 49 years ago. Around the country —at Riverside Church in New York with Rev. William Barber and Ruby Sales and Michelle Alexander, in Memphis with Rev. Barber again, in Boston and a myriad other places, in the pages of the New York Times and the Philadelphia Inquirer and the Washington Post and Tikkun and Sojourners and with Democracy Now, the Stony Point Center and the Fellowship of Reconciliation and the National Council of Elders and the Vietnam Peace Commemoration Committee and the “US Department of Arts and Culture” (not a government agency!) and Interfaith Moral Action on Climate and in many many more places — the “Beyond Vietnam” prophetic utterance was lifted up. Later this month the Ecumenical Days of Advocacy by many Christian leaders will focus the triplets of Racism, Materialism, and Militarism. I see this as a beginning for all of us. I hope we will keep in touch with each other . I invite each and all of us to send our thoughts and plans to <MLK50.org> as we continue to unfold the meaning of Dr. King's prophetic outcry into this year ahead, the Jubilee Year of Truth and Transformation. 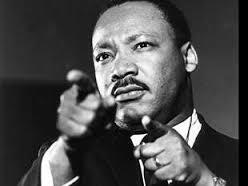 And I hope we will start planning now for one year from now at the fifieth anniversary of Dr. King's death. It is already clear there will be a great outpouring. Let us make sure it will address the profound and prophetic depth of Dr. King.